IS MONTICHIARI A CONTINUATION OF FATIMA? It was in 1531 that the Mother of God appeared to Juan Diego in Tepeyac Hill in Mexico and performed "the miracle of the roses" as proof to Bishop Zumarraga of her presence. Roses never grew on that rocky terrain, and certainly not in December. Moreover, when, in their surprise, the bishop's attendants tried to pick and take some of them from his tilma, they could not do so because they became, as one author put it, "not roses that they touched, but as if they were painted or embroidered." Indeed, they were "mystical roses" from the hands of the Mystical Rose herself. The Litany of Loreto lists many of her titles, but there is a flower amongst them; the Mystical Rose. Truly, the rose is the queen of all the flowers, and there is something in the Heavenly arrangement of Its petals and Its coloring, there Is something In Its scent and symmetry, In the modesty of its green leaves, which makes it very special. It is the flower which captures the heart at nearly every stage of its growth, even when a bud. While It grows, Its petals gradually unfold as a token, as It were, of the blossoming of the lover's love for his loved one. Mary, the most beautiful of God's creation, is indeed "the Incarnate Rose," especially chosen for God's garden. She is the "rose of Sharon and the lily of the valleys" [Song 2:1]. There is no rose comparable to her and she has made Paradise ever so much more beautiful. But if you call her a rose, white is the color of her purity; gold, the tint of her royalty; red, the hue of her suffering. The rose grows out from a stem of thorns and in the heart of this flower, the red of the Cross of her son was forming. Indeed, without thorns a rose is not a rose, and without the thorn of great suffering, Mary could not have become the Mystical Rose of God's Paradise. Montichiali with its suburb Fontanelle is a small town in Northern Italy, twenty kilometers from Brescia, the bishop's town. It is situated in front of the Italian Alps in the fertile plain of the river Po. The name means in English, "Bright Mountains." On a hill lies the old castle of St. Mary and the venerable Church of San Pancrazio. Pierina Gilli was born on August 3, 1911, at Montichiari and worked as a nurse in the hospital there. The first time, the dear Mother of Christ appeared to her in a room of the hospital, in the spring of 1947. Our Lady, a beautiful woman, wore a violet dress and a white veil around her head. She was very sad, her eyes were filled with tears which fell to the floor. Her breast was pierced by three big swords. Our Lady said, "Prayer-Penitence-Expiation" and was silent. 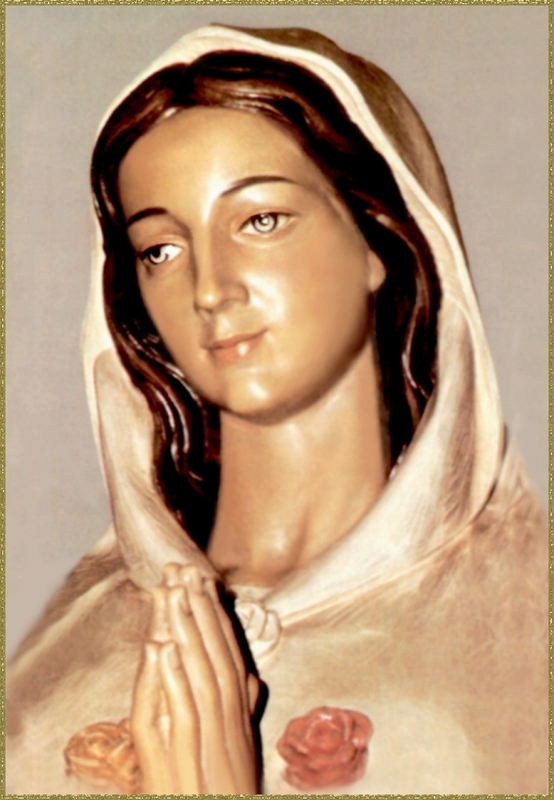 On June 13, 1947, Our Lady appeared again in the hospital early one Sunday. morning. This time she was dressed in white and instead of the three swords she had three roses: a white one, a red one, and a golden one. Pierina Gilli asked her, "Please tell me who you are." The Lady answered, smiling, "I am the Mother of Jesus and the Mother of all of you." days, special prayers of preparation should be said." With an expression of great joy, she went on, "On this day I shall send to these religious institutes, members of orders, and secular priests who have honored me in this way, a superabundance of graces and great sanctity. I wish the 13th of July of each year to be celebrated in honor of the 'Rosa Mystica,' the Mystical Rose." Pierina asked whether she would perform a miracle. Our Lady answered, "The most evident miracle will be the godly souls, who for some time, especially during the last war, became lukewarm, so that they were unfaithful or even betrayed their vocation, will cease to offend Our Lord gravely. By their great offenses, they brought punishment and persecution upon the Church-----as we experience it in our days-----but then the original spirit of their holy founders will blossom again." With these words the conversation ended. Now Our Lady explained to Pierina the meaning of the three swords and the three roses. A moving explanation which is to taken quite seriously! The first sword means loss of the vocation as a priest or a monk. The second sword means priests, monks, and nuns who live in deadly sin. The third sword means priests and monks who commit the treason of Judas. While giving up their vocation, they often lose also their faith, their eternal beatitude, and become enemies of the Church. The white rose means the spirit of prayer. The red rose means the spirit of expiation and sacrifice. The yellow or golden rose means the spirit of penitence. The beautiful woman appeared again, this time in the chapel of the hospital in Montichiari during the service. Many employees of the hospital, some physicians, and people from the town were present. Our Lady asked for the realization of the devotion she had recommended and said among other things, "My Divine Son, tired of the continuing offenses, wanted to act according to His justice. So I placed myself as a Mediatrix between Him and the human race, especially the specially consecrated souls." Pierina thanked her for that in the name of all who were present. Our Lady took leave with a beautiful thought for Pierina saying, "Vivi d'amore!" which means, "Live for love-----for charity!" Our Lady appeared publicly in the parish church of Montichiari in the presence of some people, among whom were also several priests. Among other things she said, "Our Lord, my Divine Son, is tired of the many offenses, the severe offenses, the sins against holy purity . . . " Here she paused and then went on, "He wants to send another flood of punishment. . . ." Here she stopped again for some moments and then went on, "I have interceded that He may be merciful once more. Therefore I ask for your prayer and penitence to expiate these sins." Pierina said, "Yes!" and agreed to these wishes of Our dear Lady. The conversation went on, "I ardently ask the priests to admonish the people in love that they do not commit these sins any more." Pielina asked, "Will He then pardon us?" Our Lady answered, "Yes, so long as one does not commit them any more." With these words she went away. Our Lady appeared again in the parish church in the presence of several persons. First she told Pierina Gilli to make four crosses with her tongue on the floor just in the middle of the church, exactly under the dome. (A humiliating act of expiation!) Then she descended on the crosses and said, "I descend on this place because it is here that great conversions will occur." Somewhat sadly she went on, "Today specifically, there are Christians of your Italian nation who most offend our Lord, my Divine Son Jesus, by their sins against holy purity. Therefore, the Lord demands, prayer, great sacrifices, and penitence." Pierina asked, "What have we to do to fulfill your wish for prayer and penitence?" Our Lady answered mildly, "Prayer" (here she was silent for some moments and continued), "Penitence means acceptance of the little daily crosses and also doing one's work in the spirit of penitence." And in all her majesty she gave a promise with the following words, "On December 8th, at noon, I shall appear here again in the parish church and it will be the hour of grace." Pierina Gilli asked, "Please, explain to me! What does it mean, the hour of grace?" 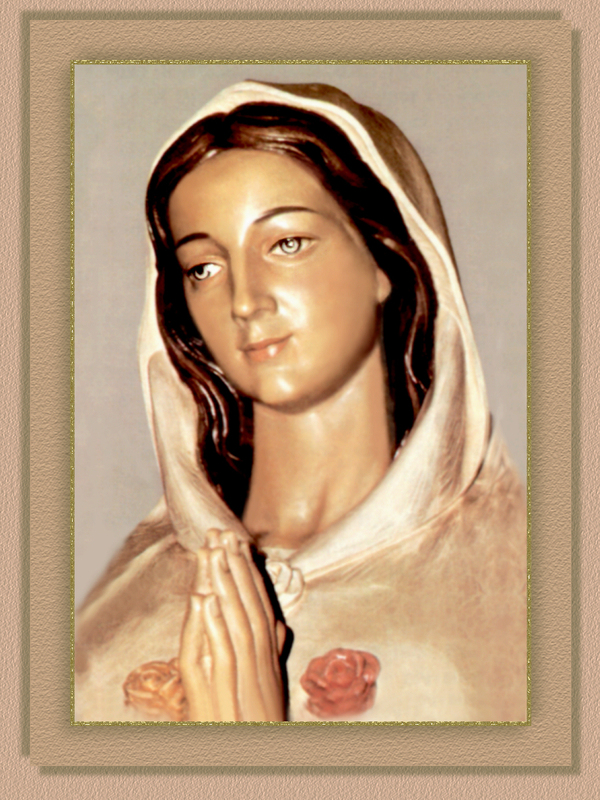 Our Lady replied, "The hour of grace-----great and numerous conversions will occur." Here she paused again for some moments and continued, "Souls, totally hardened, cold as this marble, will be touched by Divine grace and become faithful and God-loving again." This was the only time that Our dear Lady predicted a future appearance. All the other apparitions happened unexpectedly. This time when Our Lady appeared again in the parish church there were only three persons present. Among them was the Reverend Confessor of the seer. Our Lady, as "Rosa Mystica," wore a white cloak. This was held at the right side by a boy, at the left side by a girl. Both were also dressed in white. Here she made a somewhat longer pause, then continued, "Here in Montichiari I wish the devotion of the 'Rosa Mystica,' together with the veneration of my Immaculate Heart, to be increased in the religious institutes and the monastic communities, in order that these souls dedicated to God may receive more graces from my motherly Heart." Then Our Lady told Pierina a mystery and promised that she herself would let her know when she had to reveal it. Pierina asked, "Who are the two children at your side?" Our Lady answered, "Jacinta and Francesco. They will be your companions in all your afflictions. They too have suffered, though they were much younger than you. Look, this is how I would like you to be-----simple and good-----as these children used to be." Our Lady extended her arms protectingly, looked up to Heaven and exclaimed, "Sia benedetto il Signore!" which means, "Praised be the Lord!" Then she disappeared. On this great feast of St. Mary, some thousand people had gathered from everywhere. Pierina Gilli had great difficulty in getting into the overcrowded parish church. She knelt down on the spot where the other appearances had taken place. While people were praying the Rosary, she exclaimed, "Oh, La Madonna!" (Our Lady). At once, there was a great silence. The pastor, Monsignore Abate Francesco Rossi, reported that many participants told him later, (though thousands of people were in the overcrowded church), it had become so still that one could hear the humming of a single fly. Our Lady appeared on a big white staircase which was decorated on both sides with white and yellow and red roses. Our dear Lady smiled and said, "I am the Immaculate Conception." And with great majesty, descending, she said, "I am Mary of Grace, that is, the Full of Grace, Mother of my Divine Son Jesus Christ." Descending farther she continued, "I come here to Montichiari because it is my wish to be appealed to and venerated as 'Rosa Mystica.' I wish people to celebrate each year on December 8th at noon the hour of grace for the whole world. With this exercise, one will receive numerous spiritual and bodily graces. Our Lord, my Divine Son Jesus, will be abundantly merciful so long as good men go on praying for their fellow men. As soon as possible, let the Supreme Shepherd of the Church, Pope Pius XII, know it is my wish that this hour of grace be publicized and spreadthroughout the whole world. If someone cannot go to church at this time, he is to pray at noon at home, and he will receive graces from me. He who prays on these bricks and sheds tears of repentance will find a secure ladder to Heaven and get protection and graces from my Motherly Heart." With these words Our beautiful and radiant Lady showed Pierina her Heart and burst into the following words, "Look at this Heart which loves human beings so very much, though most of them overwhelm it with abuses!" Here she paused a moment, and then went on, "When good people and bad people unite in prayer, they will receive mercy and peace from this Heart. At present the Lord has been merciful to the good ones because of my intercession. This has delayed a great judgment of God." Smiling, she went on, "Very soon, one will know how important this hour of grace is." Pierina noticed that she was about to leave and said, "Oh beautiful, dear Saint Mary, I thank you! Please bless my homeland Italy, bless the whole world, especially the Holy Father, the priests, the monks and nuns, and the sinners." Our Lady answered, "I have an abundance of graces ready for all those children who hear my voice and take my wishes to heart." With these words the vision ended. Also during this vision Our Lady confided to Pierina a secret and promised to come again and tell her when the moment would come for revealing it. Parents brought to the church a boy of about five or six years who was suffering from polio and could not stand or walk. Other parents brought their daughter, about twenty-six years old, who suffered since she was twelve years old from severe tuberculosis. She had not been able to utter a single word for the last nine years. In the same moment both were completely healed. The girl who had not been able to speak a word for the past nine years now sang a song of praise with a full voice. Since then she has been able to sing and speak without any difficulty. The parents of the boy carried him in their arms into the church, now he could stand and walk. Later on he was shown in public from a balcony to the rejoicing crowd in the big square in front of the church. The whole crowd was deeply stirred when they saw the child jump up and down. He declared, "I have seen Our Lady in the church and she smiled at me benevolently." Since that time both have been in good health. The boy married some years ago and the girl has become a pious God-fearing nun who is living only to expiate for the religious orders and priests. The third miracle happened during the time of the appearance of Our Lady, not in the church of Montichiari, but in a private home of the town. A woman of about thirty-six years was healed at home during the time of the apparition. From childhood on she was not normal but also not completely mentally disturbed. She could not speak, but the worst thing was that she had no control over her bodily functions. Her sister-in-law had to stay with her at home while her father went to the cathedral to the anticipated appearance of Our Lady. Her sister-in-law prayed the holy Rosary at the time of the appearance and exclaimed spontaneously, "Our dear Lady, if you are really present in the Church of Montichiari, please heal this poor sick girl!" In the same moment the sick person was healed completely. She was healed forever! Loud and full of joy she prayed with her sister-in-law the holy Rosary to the end. When the father came home from the church, he was astonished and full of joy upon seeing his daughter healed. This miracle especially caused a sensation and was later declared to be the most important one by several physicians. As in this case, any mass suggestion had to be excluded. The healing was lasting. The girl died some years later, but one of her brothers is still alive and can witness to all this. Please note that one of Mary's titles as has been recorded above is Mystical Rose, and that there is a famous traditional image called Mystical Rose; this is not the one of Montichiari. There is a link below related to the Mystical Rose. YOU ARE REFERRED TO STORY OF THE APPARITIONS AND HOW THYE RELATE TO THE CHURCH, HERE.